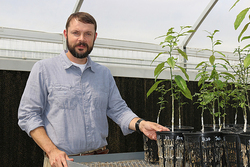 Dr. Jay Spiers, an associate professor of horticulture at Auburn University, will be the guest speaker for the Stephen F. Austin State University SFA Gardens' monthly Theresa and Les Reeves Lecture Series, slated for 7 p.m. Aug. 9 in the Brundrett Conservation Education Building at the Pineywoods Native Plant Center. NACOGDOCHES, Texas - Stephen F. Austin State University's SFA Gardens will host the monthly Theresa and Les Reeves Lecture Series at 7 p.m. Aug. 9 in the Brundrett Conservation Education Building at the Pineywoods Native Plant Center, located at 2900 Raguet St.
Dr. Jay Spiers, an associate professor of horticulture from Auburn University, will present, "Alternative Fruit Crops for a Changing Gulf South: What's on the Horizon?" Spiers' professorial appointment consists of 70 percent research, 25 percent teaching and five percent service. His research focuses on sustainable fruit crop production systems and includes work with blueberry, kiwifruit, satsuma mandarin, blackberry, persimmon and pomegranate. He also teaches undergraduate- and graduate-level classes in the horticulture department pertaining to fruit production. Spiers holds a Bachelor of Science and Master of Science in horticulture from Mississippi State University and a doctoral degree in horticultural sciences from Texas A&M University.